This measurement will give you four Dosas approximately. Add water to this mixture to form batter. Mix the chopped Onion, Chilli and curry leaves together and add it to the batter. Keep this batter aside for 15 minutes. (The water in the batter comes on top separately. This allows the flavor of onion and Chilli to mix with the batter). Heat the tawah and apply oil evenly on it. Pour the batter in the tawah along the sides and spread it inwards towards the center to form a thin layer. This method of spreading is most suitable for this batter. Turn the Dosa to the other side and allow it to be cooked. 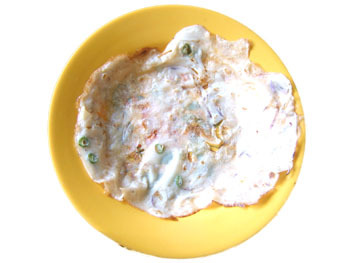 To get crispy Dosas, spread the batter into a thin layer and cook in medium flame. Overheated tawah will not allow you to spread the batter well. Sprinkle water on the tawah to cool it.